When Vanessa James was a little girl, her mother would tell her bedtime stories of growing up like Tarzan in the jungle raised by a colony of monkeys. As James got older, she learned those accounts were not fantasy but part of her mother's unbelievable history. 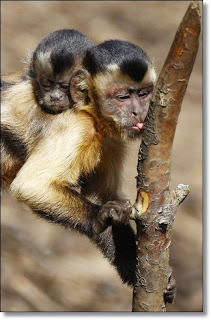 Between the ages of four and ten, Marina Chapman's family consisted of 20 or so Capuchin monkeys, native to the jungles of South America. Her memory of how it all started is hazy-she remembers sorting peas in her village when in an instant a hand covered her mouth and she awoke in the jungle. "All she can remember is being chloroformed with a hand over her mouth," James, told London's Sunday Times this past week. 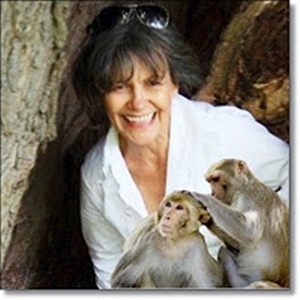 "It's assumed that the kidnap went wrong,"
Two days after fending for herself, she was approached by a colony of monkeys who taught her by example to forage, feed, and survive as one of their own. "Acting entirely on instinct, she tried to do what they did: she ate what they ate and copied their actions, and, little by little, learned to fend for herself," according to a press release for the Marina's memoir, The Girl With No Name, to be released in 2013 by Pegasus Books. As Chapman adapted to jungle life, she lost any language she had learned in her early years, and instead developed an inhuman ability to scale trees and to communicate with creatures native to the forest. After more than five years, she was discovered by hunters who sold her into slavery in exchange for a parrot. A year later she escaped, narrowly avoiding a life of prostitution. She then lived off the streets in Colombia, relying on her stealth knowledge gleaned, in part, from her education in the jungle. In her 20's while working as a household staff for a Colombian family, she was brought on a trip to Bradford, England. There she met her future husband at a church, a bacteriologist named John Chapman, and she never left. Together they raised two children. She worked as a cook, and later in social services helping at-risk youth. Over the past five years, her daughter Vanessa, now a 23-year-old film composer, has been devoted to transcribing her mother's memory, matching the nuts and berries, and wildlife in Chapman's jungle recollections, with those native to the area she was abandoned in. Recently, mother and daughter traveled back to Colombia to find Chapman's long-lost family, reconnecting with some surrogates who took her in in her teens. She even tried re-entering the jungle before being stopped by military officials. There have only been a handful of modern-day accounts of feral children surviving this unique upbringing and ultimately assimilating back into human life. In 1999, a young boy was rescued in the Uganda jungle after being raised by monkeys. It took him eight years to learn to speak again. Today, Chapman is in her mid-50s, though she has no document proving her exact age. Her English writing is weak and her daughter provided much of the translations for Barrett-Lee's formulation into memoir. According to James, the most glaring sign of her mother's past is the fact that she rarely, if ever, cries. "I guess it's an emotional effect of her earlier life," said Vanessa in her interview with Times. Chapman's memoir, The Girl Without a Name, authored by both mother and daughter, as well as Barrett-Lee, was purchased by publishers in the U.K., Holland, Australia and Italy this past February. It's slated for release in the U.S. by Pegasus books sometime in April of 2013. Vanessa and her mother both declined an interview with Yahoo! Shine, opting instead to wait for the book's publication. It's unlikely interest will subside six months from now. For Marina, the chance to tell her story is second only to the opportunity to help young victims of kidnapping. She plans to donate a portion of the proceeds of her book to charities to combat child trafficking and slavery in Colombia.